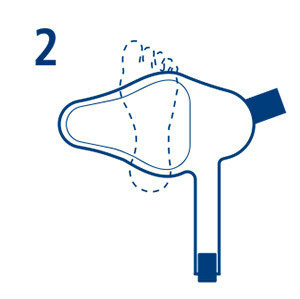 Meant to prevent the development of deep vein thrombosis (DVT) or peripheral edema in immobile patients, the DVT Sequential Compression Device uses a foot sleeve with a rigid base which fills with air and then deflates in a programmed cycle, similar to the stimulation from walking. 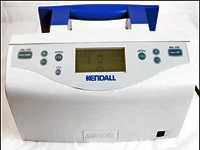 This device has push button control and an LCD display, which displays the pressure status in mmHg. Utilizing a powerful pump formed by the venous plantar plexus in the sole of the foot, the A-V Impulse System®* foot pump imitates the natural sequence of physical venous flow. DVT Sequential device is clinically proven to provide DVT prophylaxis, reduce post operative trauma, pain and swelling in the lower and upper limbs while enhancing arterial blood flow. Utilizing a powerful pump formed by the venous plantar plexus in the sole of the foot, the foot pump imitates the natural sequence of physical venous flow. Clinical efficacy Over 17 published peer reviewed studies documenting the A-V Impulse System®* foot pump's ability to reduce the incidence of DVT, post operative pain and swelling, and increase arterial enhancement. 0.4 second rapid inflation Simulates the weight bearing process. 1 or 3 second impulse hold times Accommodate all injury types. 130mmHg impulse pressure (adjustable from 60 to 200mmHg) Balances efficacy and patient comfort. Adjustable to accommodate individual patient requirements. Preset to the optimal clinically proven parameters Facilitates ease of use. Microprocessor controlled User friendly digital design. Enables customization of parameters. User friendly icons identify fault codes. Internal self-test ensures product function. 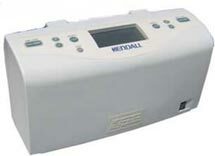 Automatic pressure adjustment maintains pressure levels below 200mmHg Ensures that the patient receives the prescribed therapy. 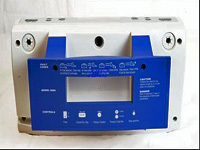 Low and high-pressure audio and visual alarms Ensures patient safety. Trouble shooting icons Easily identifies fault conditions. A quick reference is located on the bed mount. Back lit screen Easy to read day or night. Provides quick visualization of pressure and duration impulse settings. Confirms that the proper pressure is being delivered. Top mounted control panel Easy visibility and accessibility which is located on the top of the pump. One step therapy Just turn it on, no adjustment required. User friendly, all the clinician needs to do is turn the pump on and then turn on the required left and/or right RUN/STOP channels. Sleek design, rounded edges Reduced areas where dirt will accumulate. Easier to clean. Compact design Low profile at end of bed. Easy storage, when not in use. Integrated bed mount The pump is off of the floor. The pump does not compete for space with other equipment. The pump is more accessible to the clinician. Clear display Provides consistent confirmation of appropriate therapy. 1. For improved efficacy, apply T.E.D.™ anti-embolism stocking or stockinette over the foot and ankle as required. Avoid wrinkles. 2. Select size of Impad foot cover. Place foot centrally as shown. 3. Wrap inside of the foot cover over top of foot. Overlap outside of foot cover. Secure the strap around the heel. 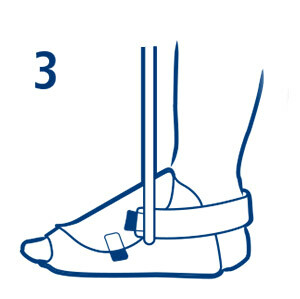 When utilizing the A-V Impulse System®* foot pump what is the proper positioning of the patients limb? The patient's foot must be below the level of the patient's heart. the efficacy of the A-V Impulse System®* foot pump for DVT prophylaxis. Yes, there are approximately 17 peer-reviewed clinical studies documenting the ability of the A-V Impulse System®* foot pump to reduce DVT. Can the A-V Impulse System®* foot pump reduce pain and swelling? Yes. Multiple clinical studies have proven its ability to reduce upper and lower limb swelling, which ultimately reduces pain. Which patient population other than orthopedics can the A-V Impulse System®* foot pump benefit? 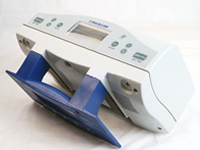 The A-V Impulse System®* foot pump is easy to apply for the morbidly obese patient population. Foot application only.